The bestselling author of the No. 1 Ladies’ Detective Agency series deftly escorts Jane Austen’s beloved and meddlesome heroine, Emma, into the twenty-first century in this delightfully inventive retelling. The summer after university, Emma Woodhouse returns home to the village of Highbury to prepare for the launch of her interior design business. As she cultivates grand plans for the future, she re-enters the household of her hypochondriac father, who has been living alone on a steady diet of vegetables and vitamin supplements. 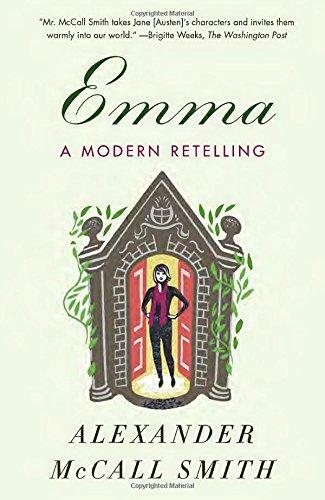 Soon Emma befriends Harriet Smith, the naïve but charming young teacher’s assistant at an English-language school run by the hippie-ish Mrs.
Alexander McCall Smith’s gentle satire and cozy, old-fashioned sensibility prove to be the perfect match for Jane Austen’s wit and characters. Though carriages have been replaced by Mini Coopers, and cups of tea with cappuccinos, Emma’s story is wonderfully timeless. Alexander McCall Smith is the author of the No. 1 Ladies’ Detective Agency series, the Isabel Dalhousie series, the Portuguese Irregular Verbs series, the 44 Scotland Street series, and the Corduroy Mansions series. He is professor emeritus of medical law at the University of Edinburgh in Scotland and has served with many national and international organizations concerned with bioethics. He was born in what is now known as Zimbabwe and was a law professor at the University of Botswana. He lives in Scotland. Why do you think Alexander McCall Smith decided to revisit Emma, of all of Jane Austen’s novels? Describe Emma’s character in this version. How does it differ from that of Austen’s Emma? In what ways is she “modernized”? What is Emma’s position in life? How does this shape her worldview? Describe George Knightley’s connection to the Woodhouse family. In what ways does he serve as a foil to Emma? How does that focus the bond between the two of them? What is the relationship between Miss Taylor and Emma? How does this differ from the way it is depicted in Austen’s version? Describe Harriet Smith. Why is Emma so interested in her? How does Philip Elton fit into Emma’s life? In what ways are Emma and Philip alike? Why does Emma reject Philip? A pivotal moment in Austen’s Emma was the shaming of Miss Bates. How has McCall Smith handled the Victorian idea of rank in this contemporary context? What role does Frank Churchill play in the story? What do you think of the way he treats Jane Fairfax? Why doesn’t Emma like Jane Fairfax? Is this fair to Jane? What elements of Austen’s work have become more apparent through McCall Smith’s deft handling of the text? What nuances of Austen’s sense of humor and sense of morality has McCall Smith captured the best? Which character has changed the most, from Austen to McCall Smith? Who is the most amusing character in our contemporary story? Austen seems to find Emma a little ridiculous. Why would she be unsympathetic to her own character? Does McCall Smith soften this? How? Emma’s matchmaking has some serious consequences. How does her meddling go awry? How does she make amends for her meddling? Which things are not able to be fixed? What is the most modernized feature of McCall Smith’s Emma? Which parts of the story are new and how does McCall Smith use them without changing the general timbre of the story? What, in the end, does Emma learn? How is it that she finds happiness? Discuss your favorite change between the original and the retold story of Emma.